Growing up in a family obsessed with good food, I quickly learnt the difference between fresh baked bread and day old stale bread. On a daily basis, my Dad or Mom would come home with fresh bread and once we ate what we needed that day, we would immediately freeze it to ensure freshness. Call me crazy, but I for one still cannot eat day old bread. A few weeks ago on a chilly Sunday morning, my best friend and her fiancée invited me to grab a quick bite and then some shopping. As I jumped into their car, they both informed me they wanted Schwartz’s, without hesitation we set off towards St. Laurent Blvd. Arriving at Schwartz’s, the line up was huge and we decided not to wait. I immediately suggested Hof Kelsten as I had been dying to try their gravlax sandwich and of course buy some bread. We headed up St. Laurent Blvd and found parking right in front of Hof Kelsten. The un-finished decor at Hof Kelsten provides for a laid back casual and comfortable vibe. The staff is very friendly and are more than happy to help you decide what to order. Hof Kelsten’s menu boasts a delicious selection of sandwiches as well as a few specials of the day. I knew exactly what I wanted, the gravlax sandwich served on the caraway rye bread. 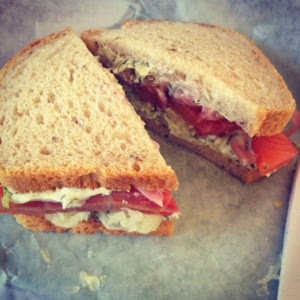 The sandwich is piled high with deliciously flavoured thick slices of homemade gravlax, a dill cream cheese spread, fennel, cucumbers and salty briny capers. Each element of this sandwich was noticeable with each bite I took. The dill cream cheese was light enough to let the flavours of the gravlax stand out and the crunchiness of the cucumbers and fennel allowed for the perfect blend of textures. 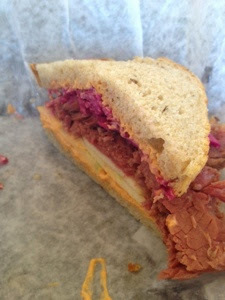 This sandwich is so good and completely addictive. My friend also had the gravlax, but her fiancée had the brisket sandwich. A large pickled beef brisket sandwich served warm and topped with apples, a red cabbage and beet slaw, and a house made Thousand Island dressing, this sandwich takes the classic eastern European dish to an entire new level of flavour. From soft tender meat to the crunchiness of the apples and slaw, this sandwich has it all. We all finished our sandwiches quite quickly and ran back to the counter to order some bread. I quickly ordered half a dozen onion Bialys. Montrealers have bagels, Floridians have Bialys. Well at least that’s how my family looks at it. You can’t get a decent bagel in Florida, so we always stick to Bialys; a “bagel-shaped” bread that can be served plain or topped with caramelized onions. 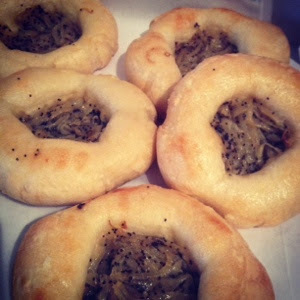 Hof Kelsten’s onion Bialy’s are fresh, soft and chewy, making one delicious treat. Toasted in a toaster oven and drenched in butter is my favourite, or with really good cream cheese, but even plain these guys are so good. Along with my Bialys, I also ordered a Caraway rye and sunflower seed bread. The breads at Hof Kelsten are what I call “real bread.” Not that fake sandwich bread you find in the bread isle at Loblaws. 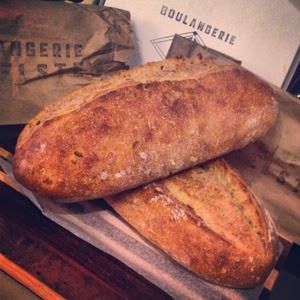 The Caraway rye or Kimmel bread is out of this world delicious. So good that even my Mother a hater of caraway seeds enjoyed this bread without even realizing what she was eating. The sunflower seed bread was just as delicious but with a nuttier taste. The next Sunday, my Mother and younger sister joined me for brunch at my new favourite place. I tried to convince my Mother to order the gravlax, but when she saw they had salty French toast on the menu, she couldn't help but order it. 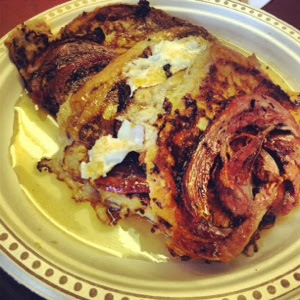 I couldn't blame her, thick sliced Challah French toast [the real way to make French toast] served with two fried eggs, house-made veal pancetta (bacon) and real maple syrup, who wouldn't order that? I was going to order that myself, but I had a feeling it was going to be too much for my Mom and ordered the gravlax just in case she wanted to switch. I was right, five bites in I was eating French toast. The veal pancetta had a spiced flavour and I could tell immediately that this wasn't your average breakfast meat. Salty and savory, I loved each and every bite; it also complimented the sweet delicious French toast perfectly. The eggs were great and cooked over easy, but I did not see the necessity in having them on the plate. 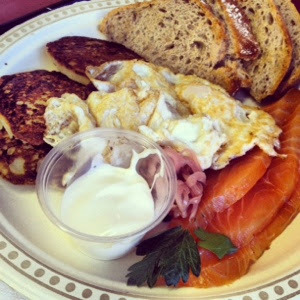 My sister ordered the gravlax plate; two fried eggs, a generous amount of thick slices of Hof Kelsten’s gravlax, pickled onions, potato latkas, sour cream, and rye toast. 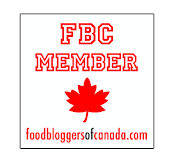 The gravlax has so much flavour and is so good that it really does not need anything to accompany it. The Potato latkas were good, but not as good as I had hoped. When we make latkas, they are mostly shredded potatoes and onions with minimal flour, Hof Kelsten’s were more on the pancake side. I also thought they were lacking salt, that said, they were still ok.
That Sunday, we purchased our usual breads, and then decided to try another, the pumpernickel. Hof Kelsten’s pumpernickel is not like any you may get in a regular Montreal bakery. True to eastern European tradition, this bread is dense and sticky and can barely be called bread to our Canadian standards. Sold in a dense thick rectangular loaf, this bread reminded my mother of her childhood in Russia. Thick with flavours of molasses, this bread just screams to be slathered with butter and black caviar, or if you’re a real Russian, “Selyodka” aka hearing. On Sunday the week of Purim, I stopped by to try and purchase some hamantashens. No luck, they were already all sold out! I was fortunate enough to have introduced myself to the owner and Chef, Jeff Finkelstein, and he quietly snuck me one from his personal secret stash that he was hoping to take home. He cut the cookie in half so that I could share it with my younger sister. 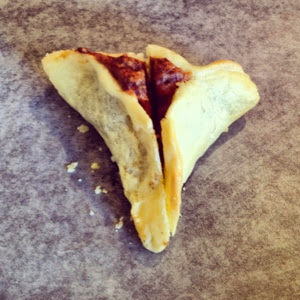 I thanked him over and over and devoured half of a delicious flaky and soft hamantashen. 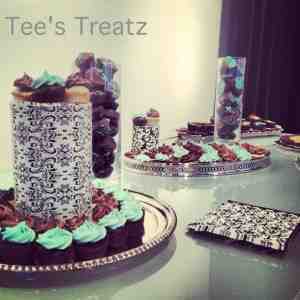 I really enjoyed it as it was not overly sweet and the dough was cream cheese based like my dad always makes – Yummm! 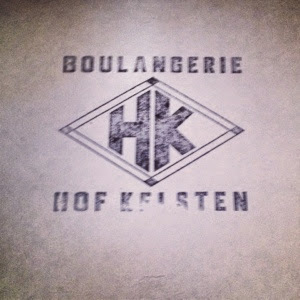 I don’t think the term bakery does justice to describe what Hof Kelsten truly is. Yes it is a bakery, but it is also a Jewish influenced European deli. Having fresh baked breads and delicious food, Hof Kelsten has become a favourite amongst many for brunch on weekends and week days. I really like this place and look forward to many visits.